Sterett DD-407 was one of ten ships of the Benham class, the last of the 1500 ton destroyer classes. The class was a Gibbs and Cox design and the ten ships were constructed at six different shipyards, the Sterett being the only one built at the Charleston Navy Yard. Her keel was laid on December 2, 1936, and she was launched on October 27, 1938. Commissioning was August 15, 1939, with Lt. Cdr. Atherton Macondray her first C.O.She had a length of 341 feet, a beam of 35 feet 6 inches and a mean draft of 11 feet. The three Babcock and Wilcox boilers had uptakes leading to a single stack and powered Westinghouse steam turbines developing 50,000 shaft horsepower for the two screws. With a 483-ton fuel oil capacity, she had a cruising range of 8,730 nautical miles at 12 knots. The original main battery configuration was four 5″/38 dual purpose guns in the new base ring mounts (vs. pedestal mounts) with the forward mounts in gunhouses and the after open mounts. Sixteen torpedo tubes in four quad mounts were amidships, two on each side. The torpedos were the 21″ Mk15 and could be used for surface contacts only. The anti-aircraft battery consisted of four .50 caliber Browning machine guns arranged with two forward of the bridge and two atop the after deckhouse. The anti-submarine battery was two roll-off depth-charge racks mounted on the fantail with a complement of five 600 pound charges each. Her initial complement was 175 crew and nine officers. At war’s end, her complement was 235 crew and 16 officers. Sterett DD-407 was awarded numerous campaign ribbons and 12 battle stars for valiant WW II service. Among them was the Navy-Marine Corps Presidential Unit Citation for extraordinary heroism in action on the night of 12-13 November, 1942 in support of the Campaign to hold Guadalcanal. Honor those shipmates who gave their lives during the Third Battle of Savo Island November 13, 1942. A reunion of sailors who served aboard the six US Navy ships (including Sterett DD-407) that engaged the Tokyo Express in the August 1943 Battle of the Vella Gulf was held at the Hyatt Regency Hotel, Crystal City in Arlington, Virginia on 7–10 August 2008. Because of the proximity of that event to the DDG-104 Commissioning ceremony in nearby Baltimore harbor on August 9th, it was fortunate that many of these WWII veterans were able to attend both events. Crew members of DD-407 attending the 65th Anniversary in Arlington were: Bill Goodson, Art Marrs, Henry McCullough, Fred Sherman, Bill Stella, Tommy Thompson and Jim Botkin. They were joined by Cal Calhoun and Jacque Hutchins for the DDG-104 Commissioning on Saturday evening. Sterett’s Deck Log covering the days leading up to, and including, the combat action on 13-14 November 1942. Read the official Action Report filed on 20 November 1942 chronicling the battle. Visit site presenting an overall description, background, and historical perspective of this naval engagement. The Battle of Vella Gulf by Daniel Arthur L. Lopez. This excellent paper provides a thorough examination of the battle. on radar picket station during the invasion of Okinawa in the final months of WWII. The Invasion of Okinawa, only 350 miles from the Japanese mainland, brought about a new threat to the U S Navy: the Kamikaze Airplanes. They were conceived by the Japanese to stop the Invasion of Okinawa by destroying the invasion fleet and cut off supplies to the troops on shore. These planes carried only enough fuel to reach the fleet protecting the invasion forces. They were flying bombs, guided by a fanatic pilot determined to crash his plane into a ship. He believed this would insure his immortality and prevent the humility of a Japanese defeat. They were determined to keep our fleet away from their homeland. This did indeed give Admiral Halsey and other fleet commanders one of their greatest concerns. The 2100 ton Destroyers, were formed in a half circle to the north, about 40 to 70 miles out, to establish an early warning, Radar Picket line. They were deployed in four ship formations and could pick up incoming enemy Kamikazes up to 150 miles north of Okinawa. They became the pigeons, or the first ships of the fleet to be reached by the attacking Kamikazes; and often the fighter planes didn’t arrive to intercept and shoot them down before they reached the Destroyers on the picket line. This had to work, as it was the only option the Navy had if we were to continue successfully to Japan. Captain Moosebrugger was put in charge of the Destroyer Squadron by Admiral Halsey. Code name, “Iceberg”, was assigned to the overall operation and on March 25, 1945, never in the history of modern Naval Warfare, had so many ships gathered in one place for the attack. On April 6,1945, the Kamikaze came out in force-determined to sink our ships that were waiting at their battle stations on full alert. They came like a swarm of locust, at all angles and attitudes. The Destroyers on the Radar Picket Line were the first to be subjected to the onslaught. Sixteen American ships were hit by the Kamikazes the first day of the invasion. In the predawn darkness of the second day, April 7, 1945, Battleships, Carriers and Cruisers, with their screening Destroyers, of Task Group 54, headed north to intercept the largest suicide weapon of all: The Japanese Fleet. The Japanese Fleet coming to attack comprised of ten ships: the mighty battleship Yamato, 1 cruiser and 8 destroyers. They wanted to stop the troops now landing on Okinawa, after thirty hours of intense bombardment by the our Naval forces. The Dreadnought, Yamato, one Heavy Cruiser and one Destroyer were sunk in the initial engagement, two additional Destroyers were sunk, fleeing toward Japan. Five Japanese Destroyers managed to limp back to Sasibo,ending their threat to the US Fleet. 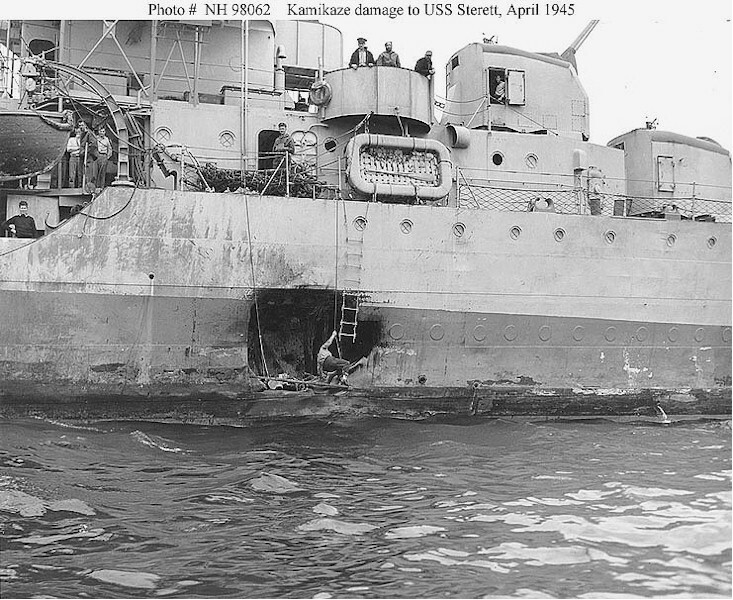 The Destroyer USS Sterett, DD407, was attacked by 5 enemy aircraft, April 10th, 1945. The first two enemy planes were shot down. 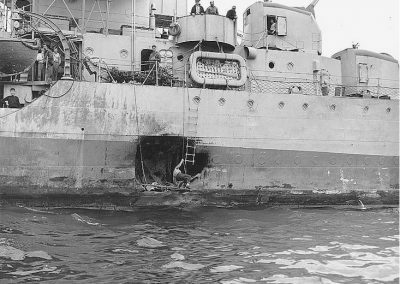 The third Kamikaze, estimated to be carrying about 2000 pounds of explosive, crashed into the starboard side, at the waterline of the Sterett, causing fires, loss of power, communications and steering: She still fought back with everything they had and was given credit for shooting down 4 enemy planes that day. Despite the Japanese desperate effort, their missions failed to destroy the invading ships around Okinawa. The Radar Pickets once again saved the Main Battle Force and protected the US Capital Ships. 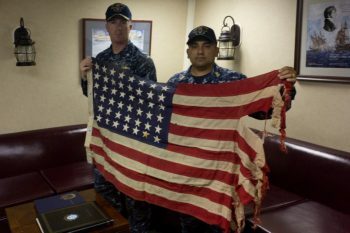 Those on Picket Stations forged new and shining traditions of the heroic devotion, in the highest traditions of the US Navy, above and beyond the call of duty. Our 2100 ton Destroyers made their contribution in blood, lost ships and men. Never in the history of the US Navy were so many men sacrificed to save our Capitol Ships from the Kamikazes. The Japanese Homeland would later feel the results of our Navy. I was an eye witness to the death and destruction taking place around Okinawa during this period. I served on the USS Wedderburn, DD 684, and the USS Cushing, DD797: both Destroyers were 2100 tons and both ships were in DESRON 58, assigned to the RADAR PICKET LINE. Want to follow the vivid first-hand account of DD-407’s role in the Atlantic and in helping to continue turning the tide across the Pacific theater in WWII? Available at: US Naval Institute Web Store, as well as most major online bookstores. The true on-board story and tribute. A must for every Sterett library!